"… our in-house estimates of leverage also point towards low leverage and directionality. Leverage and directionality have increased in the past few months. We currently estimate that Equity funds have a gross leverage around 1.75x. Our estimate earlier this year was 1.6x, while leverage was about 2.0x in its peak in 2008." 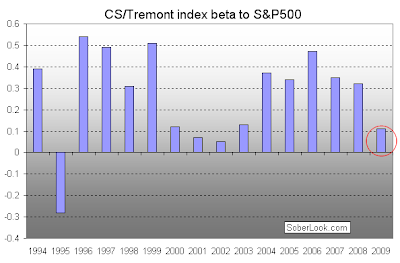 A quick analysis of the CS/Tremont index beta confirms the JPMorgan statement. The chart below shows the index beta to the S&P500 by year, a good indicator of hedge funds' market directional exposure. Hedge fund beta this year is the lowest since 2003.